4.5 25 Be the first to write a review! Easy to use and stackable. 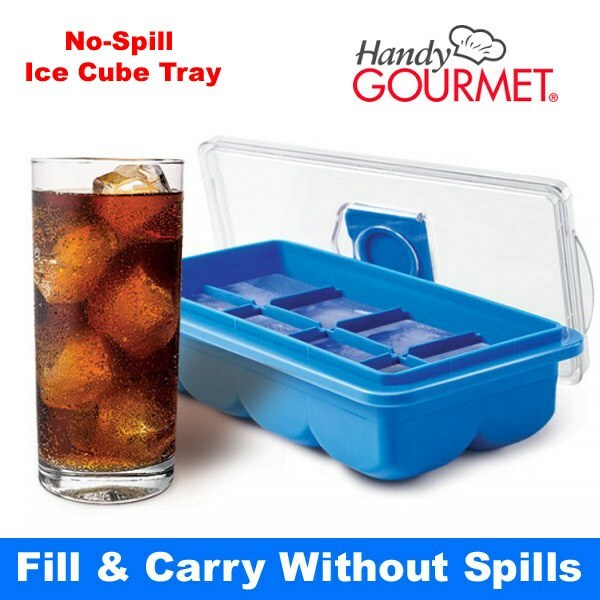 No Spill Ice Cube Tray with lid makes perfect ice cubes without the messy spills or drips. The snap on/off cover with hinged cap to fill with water allow you to carry and place in freezer without spills and keeps odor out. Soft, flexible ice cube tray allows you to effortlessly pop out each cube individually. Easy to use and stackable. Large - makes over-sizedd, jumbo ice cubes that keep your drink cold for a longer time, 9"x5"x2.25"
Cylinder - makes slim cylinder shaped ice pieces that easily fit into your water bottles, 9"x5"x1.5".